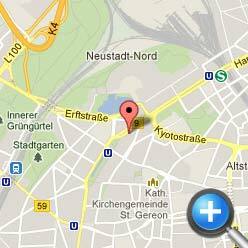 On this page you can find information about the quickest way to find us. You can get your individual route planner by clicking on the map in the right column, then clicking on the marking in the map that opens. Distance Konrad-Adenauer airport to the hotel approx. 15km. Journey time: 19 minutes !! !